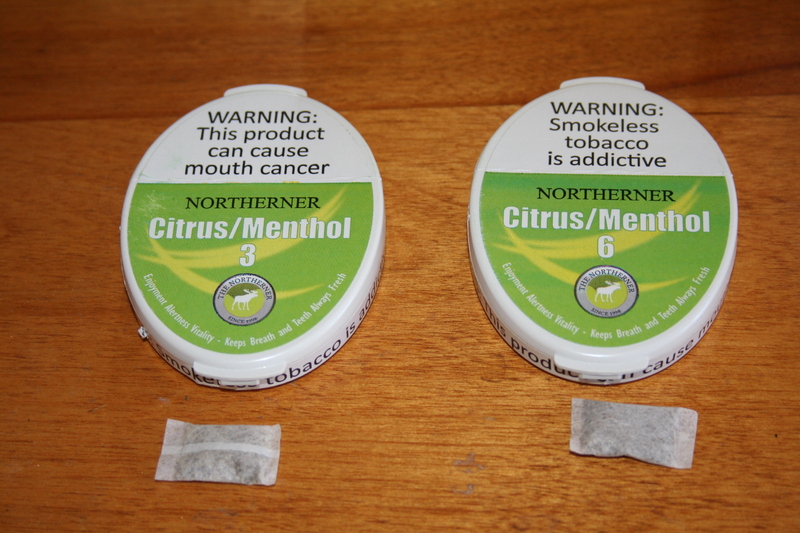 The Northerner brand of snus contains a number of interesting products, and Boost really piqued my interest. Billed as an energy snus, Northerner Boost contains caffeine, taurine, and guarana alongside nicotine which can help give you a kick of energy when you need it most. Most of the time in the morning I like to snus while drinking coffee, so being able to combine the two was a definite plus. 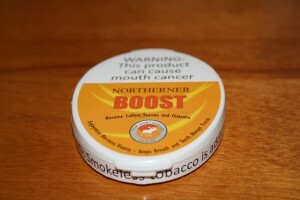 Northerner Boost also contains baking soda, which is said to help whiten your teeth and freshen your breath as you snus. As soon as I opened my can, I didn’t notice much of an aroma at all. After putting a portion into my mouth, I noticed a slight hint of honey, and it was very nice. This flavor was able to last me approximately a half hour before it dissipated and transitioned into a saltier flavor. I also noticed a slight peppery taste, which may be attributable to the tobacco. However, I didn’t detect any tobacco flavor, even when the honey taste wore off. As a dry portion snus, I wasn’t expecting very much flavor, but I did like what I could taste. Northerner Boost contains 6mg of nicotine per portion, and has 24 portions per can. Although I’m unsure of the caffeine content, I definitely noticed a slight caffeine boost alongside the nicotine which acted as a great pick me up. As someone who is sensitive to the effects of caffeine, I felt that this amount was good enough to keep me stimulated but not enough to make me feel jittery. snus. For me, it has worked great in the mornings as I’ve been able to skip my usual morning coffee and just use Boost instead. 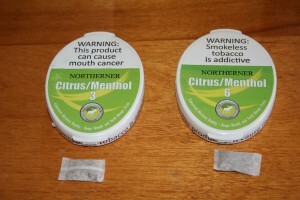 I highly recommend this snus to people looking for both a nicotine buzz as well as an energy boost. Offroad Lakrits (Licorice) White Mini is another great product from the folks over at V2 Tobacco. Based in Silkeborg, Denmark, V2 is known for manufacturing quality snus brands such as Offroad Snus and offering them at great price points. Once I opened my can for the first time, I was greeted with a strong smell of licorice, and it reminded me a lot of black licorice candies. Although I’m not normally a fan of licorice candy, I did love the smell and was excited to try a portion. After ten minutes, I began to detect a taste of salty licorice, and I found myself surprised at how good it tasted. Although it is the dominant flavor, I didn’t find the licorice to be too overpowering, and I felt that the salty taste helped to improve the flavor. After the fourty minute mark, the taste transitioned to a very salty one, and I didn’t enjoy the flavor past this point. Much like Offroad Eucalyptus, the portions material was very soft, and fit comfortably in my mouth. I was able to leave a portion in for fourty five minutes before it began to drip. 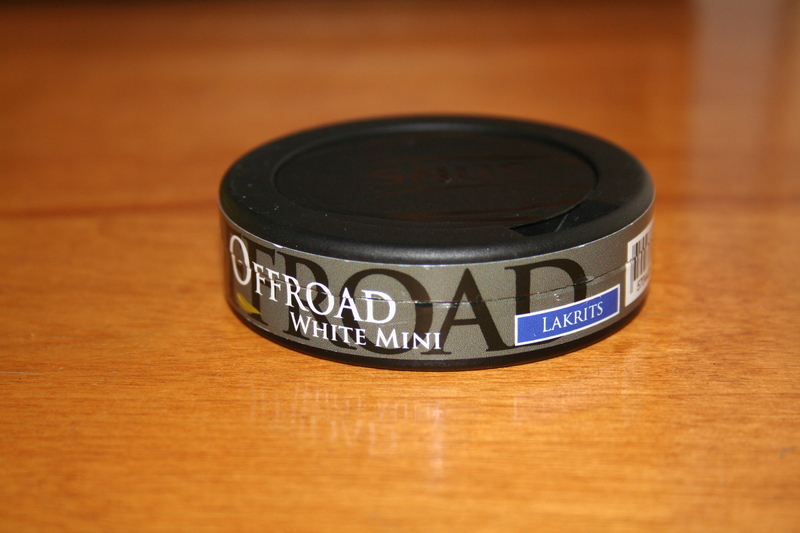 Each can of Offroad Lakrits White Mini contains 0.25 grams of snus per portion, with a nicotine content of 2mg. As a veteran snuser, I found these nicotine levels to be a bit too low for optimal enjoyment. However, they are highly discreet and those new to tobacco may enjoy the lower amount of nicotine present. 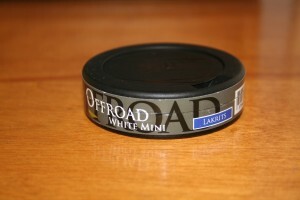 Overall, Offroad Lakrits White Mini is a great snus available at a great price. Although I’m not normally a fan of black licorice, I felt myself really enjoying this brand, and I definitely want to try the full sized version of Lakrits in the near future. 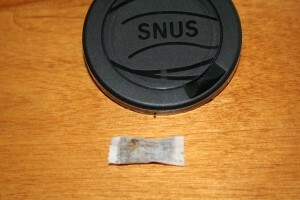 The Offroad line of snus has continually impressed me, and Lakrits is no exception. I recommend giving Offroad Lakrits White Mini a try if you’re a licorice fan or a new snuser. After mentioning Offroad Eucalyptus Mini in a previous post, I decided that its a good time to write a review on it. Manufactured by V2 Tobacco, the Offroad line is a budget brand of snus with a great taste. 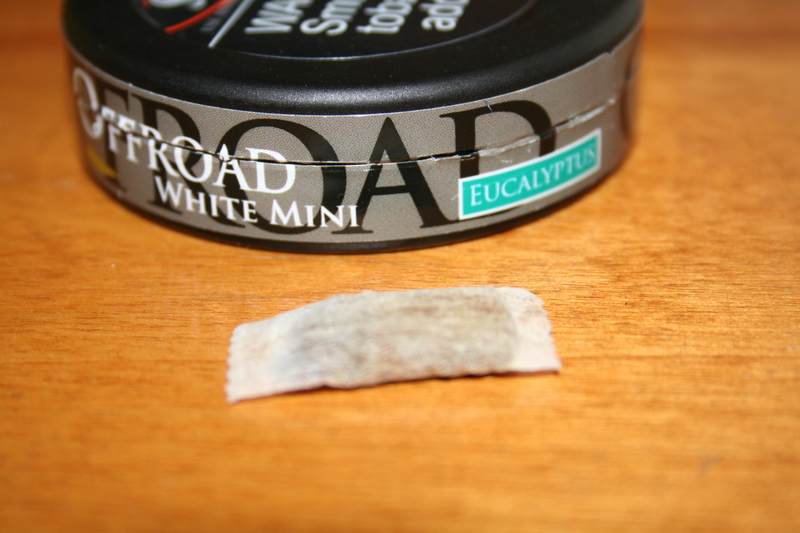 Eucalyptus mini is a white portion snus, making it fairly dry (but not as dry as some of the Northerner brands). Once I opened my can of Eucalyptus Mini, I was greeted with a strong floral smell of Eucalyptus and a touch of menthol. Upon putting a portion into my mouth, I was greeted with a soothing sensation which felt very nice. Although the taste was predominantly that of eucalyptus, I also noticed a touch of menthol which helped to balance out the flavor. Eucalyptus is frequently added to cough drops and a number of medications to soothe sore throats, and I definitely noticed a nice soothing sensation when I had a portion in. I was able to leave a portion in for about a half hour before I began to loose the eucalyptus flavor, and eventually the taste gave way to a very salty one. I wasn’t a big fan of this aftertaste, so I took my portion out for good at the forty-five minute mark. During the time I had a portion in, I was unable to detect any tobacco flavor. The portions were very soft, and being mini, I was able to fit them in my mouth without any issue. In fact, today hardly anyone could tell that I had a portion in, making it great for moments when concealment is an issue. These soft portions were quite different from the usual portions used by V2, and I hope that they eventually make the transition to these new ones throughout their lines of snus. 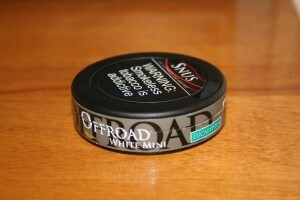 Each can of Offroad Eucalyptus White contains .25g of snus, with a total of 6 grams of snus per can. 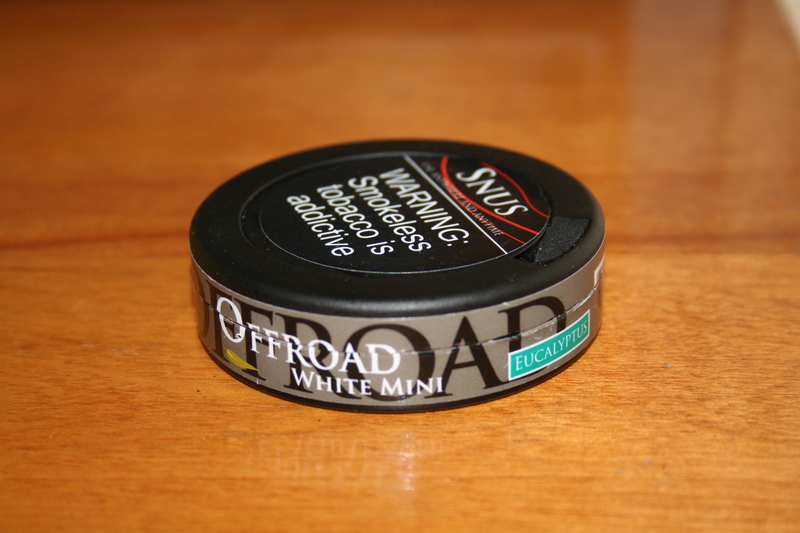 Offroad mini contains 8mg of nicotine per gram of snus, so this works out to 2mg of nicotine per portion. I felt that this nicotine content was rather low, and combined with the dryness of the portions, I didn’t notice much of a nicotine buzz. 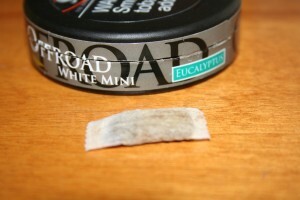 Overall, Offroad Eucalytpus White Mini is a great snus for those who enjoy floral flavored snus brands. I highly recommend this snus for those who have colds or sore throats, as the cooling sensation really helped soothe my throat when I felt sick. Although I really enjoyed the initial taste, I wasn’t too fond of the flavor that arose once the initial one wore off. 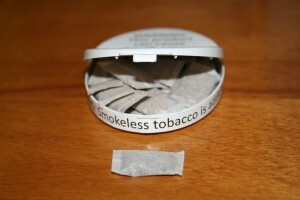 I also wish that there was a bit more nicotine per portion, along the lines of 3-4mg of nicotine per portion of snus. 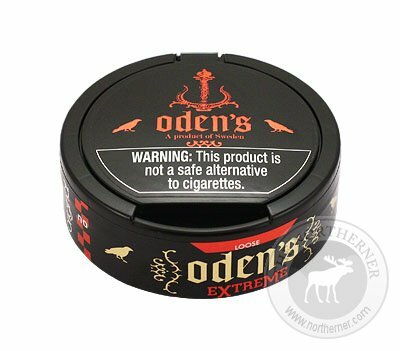 Released by Oden’s GN tobacco, Oden’s Extreme Loose is an ultra strong snus with a strong tobacco taste. 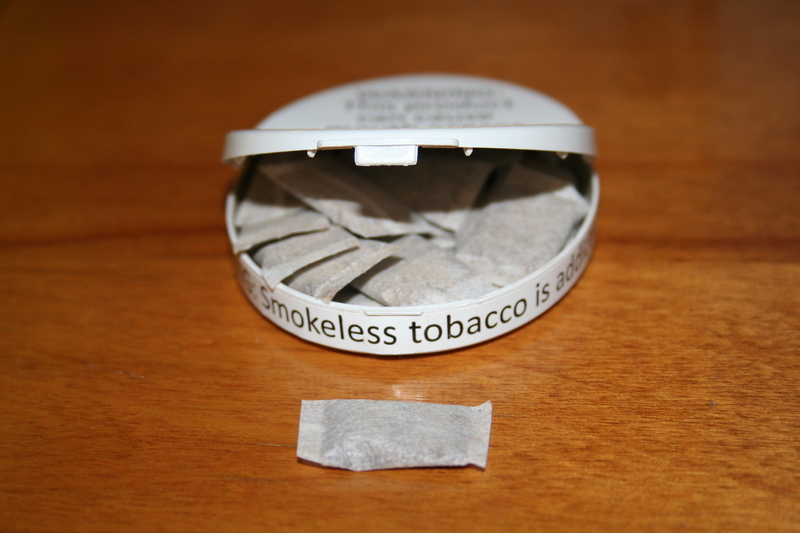 Unlike most popular brands of snus, Oden’s Extreme is fermented rather than steam cured. 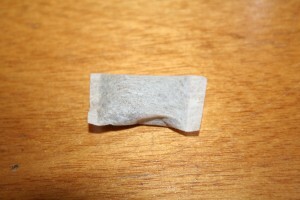 I believe that this process helps to give the snus a distinct flavor profile. Upon opening a can of Extreme Loose, I was greeted by a strong smell smell of tobacco as well as some more subtle nutty and pepper undertones. After forming a 1 gram portion with my IceTool, I put the snus in my mouth and was greeted with a very pleasant flavor unlike anything I’ve ever tasted before. As someone who enjoys tobacco flavored snuses, I found the flavor to be a real treat. Initially I noticed that the snus was slightly spicy, and this spicy flavor eventually gave way to a nutty tobacco taste after about twenty minutes. The nutty flavor reminded me a bit of Ettan, but with a more pronounced tobacco flavor and a much stronger kick. After about thirty minutes, I noticed that the nutty flavor transitioned into a strong tobacco taste which continued until I removed my portion at the forty five minute mark. 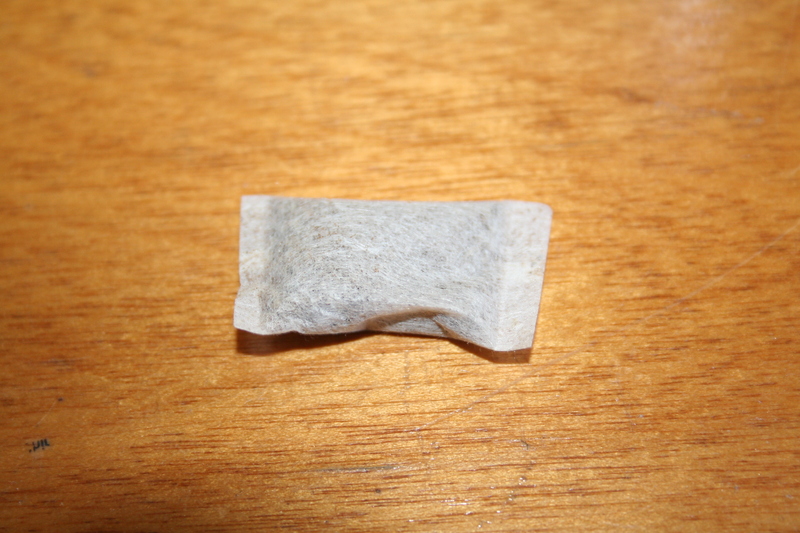 The snus was quite moist, and as a result I found that the nicotine hit came on very fast and strong. After thirty minutes my head was spinning which is rare for me when using snus. It was also very finely ground and thus comfortable in my lip. I found that I could keep my portion in for about thirty minutes before the drip became too much. Oden’s Extreme was also finely ground, and was quite comfortable to keep in my mouth. Overall, I feel that Oden’s Extreme Loose is a great brand of snus, and is currently in my main rotation. Despite this, many people aren’t very fond of the taste, so if you’re a fan of tobacco flavored snuses, I recommend trying this one out and seeing what you think of it for yourself. Also, feel free to share your thoughts about Oden’s Extreme in the comments!